Since I started artisan baking, about 7 months ago, I’m baking different types of bread almost every time. Last month I decided to discover more about Tartine. By baking the same bread for a while, I hope to discover more about bread and to develop my skills and feeling for it. And what is more delicious than eating Tartine while learning? This month it’s the 4th anniversary of Bread Baking Day. And I’m the lucky host, I choose for Bread with Local Herbs. So, I combine Tartine with Thai herbs. I wanted to use fresh herbs for a stronger taste and smell of the herbs. I don’t think you can use all the nicely smelling Thai herbs in bread, but Krathiem (garlic), Hom Deng (red onion), Phrik Thai Dam (red chili) and Bai Makrut (kefir lime leaves) will do very well. I decided to fry the herbs in a little bit of soy oil to release the aroma, the same you do in Thai cooking. I didn’t chop the garlic, but crushed it in the mortar. This also releases more flavor. All over the world people bake bread with garlic and/or onion. 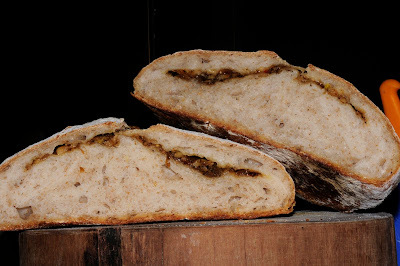 But, what makes this bread taste Thai, is the use of chili and kefir lime leaves. We love this version of Tartine. The nice flavor of the herbs, the spicy chili and especially the Kefir Lime Leaves made it Thai. You can eat this Thai Tartine with soup or as a snack. This experiment is a success; Thai Tartine will be back in my oven! The photo shows dark herbs, they are not burned as you can see on the crumb shot below. The white is too much flour! In 1 tablespoon fry the onion, garlic and chili until the onions are getting light brown. Then add the kefir lime leaves, stir in and leave for a few minutes. Let it cool completely. For this loaf I didn’t wanted to use retard proofing, I didn’t want the herbs to stay too long in the fermented dough. I fermented and proofed the same day. I made one loaf. I was very careful with adding extra water; I used 355 gram. When I use my home milled whole wheat bran I will soak it in a part of the water before adding it to the all purpose flour. I place the herbs on top of the fermented dough and fold the dough around it, so it would stay on top of the bread. As I assumed the chili was hot and having a bite with filling and some without made the bread very nice to eat. I think when I would have folded the filling trough the dough; it would have been hot all the way. A spicy bite is nice, but hot bread is not. I scored the loaf with a S. The filling came out a little bit.